Productivity Wind Power Industry | Bushman Equipment, Inc.
Bushman Equipment, Inc, a manufacturer of custom-engineered material handling solutions, has completed several projects for a global manufacturer of automotive transmissions, steering systems and axles, as well as transmission systems for commercial vehicles, off-road machinery, rail vehicles, marine craft, helicopters and wind turbines. 1) A unique Adjustable Spreader Beam with a 6.5 ton lifting capacity and a movable lifting bail. The primary engineering challenge on this beam revolved around uneven weight distribution and aligning the lifter over the oddly shaped housing’s center of gravity; lifting at a 6° angle; and then tipping to level so that the part could be placed into a machining fixture. 2) A 5,000 lb. 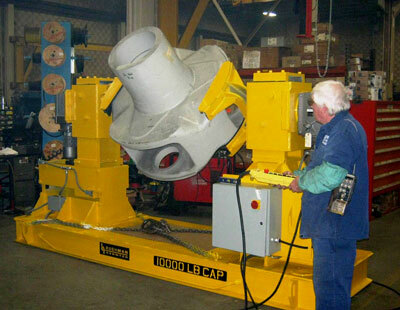 capacity ID Lifter that lowers its lifting feet down through the center opening of a planetary gearbox housing and then moves the feet outward to get a solid grip from underneath the housing. 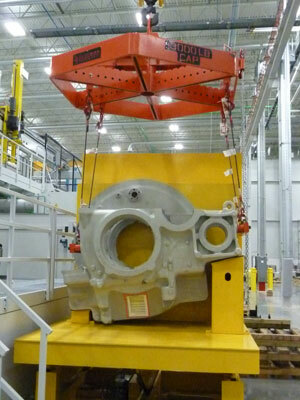 3) A first-of-its-kind Clamp Arm Inverter with 10,000 lb. capacity. This machine was designed to securely grip the same planetary gearbox housing mentioned above, and rotate it about its horizontal axis to position it for different machining operations. 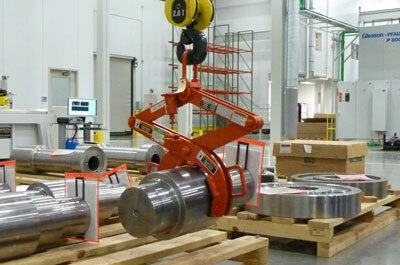 4) A variety of Tongs and Rotating Axis Grabs for lifting gear blanks, machined gears and shafts. Given the extremely high performance and high quality of the customer’s gearing, tremendous care in handling is required. With the parts’ different shapes, weights, materials and surface conditions, Bushman designed unique gripping pads for each lifter and for specific work cells. 5) A 12,000 lb. 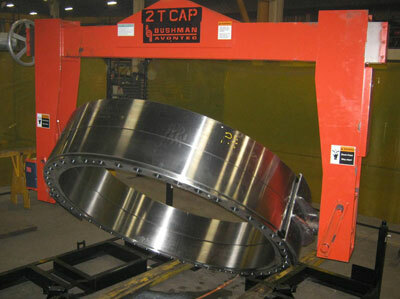 capacity mechanical upender that tips housings 90 degrees between machining operations.